This male White-crested Coquette represented just one of 30 species of hummingbirds that we found during our short tour. Photo by guide Tom Johnson. Our group enjoyed wonderful weather and great birding during this short loop along the bird-rich southern border of Costa Rica. We began with an ascent of Cerro de la Muerte (the not-so-formidable "Mountain of Death") and its accompanying mountain birding before spending two nights at the mid-elevation Talari Mountain Lodge. We shifted to the Panama border at the Wilson Botanical Garden where we found many Chiriqui endemic species, mixed flocks, and even an army ant swarm. Finally, we spent three nights in the Pacific lowlands at the lovely Esquinas Rainforest Lodge, exploring the steamy rainforest in addition to open habitats and even a taste of the famed Osa Peninsula. This tour is always a good one for hummingbirds, including a remarkable number of species that are restricted to Costa Rica and Panama - we ended up locating 30 species of hummers on Part I this time, including such gems as White-crested Coquette, Band-tailed Barbthroat, White-tailed Emerald, Volcano Hummingbird, Fiery-throated Hummingbird, Sapphire-throated Hummingbird and more. The rice fields near Ciudad Neily added some interesting diversity this year, with great sightings of the enigmatic Paint-billed Crake and several wintering Dickcissels. Our morning at the Rincon Bridge was spectacular - as the morning light welcomed us to this special place at the base of the Osa Peninsula, we enjoyed the morning flight of Mealy Parrots and Scarlet Macaws, and scanned the tree tops until the big prizes of Yellow-billed and Turquoise cotingas appeared for extended scope views. All told, we found over 100 species between the bridge and the nearby forests in just a few hours of relaxed and easy searching. It was a real treat to get to lead this tour with the kind and excellent Vernon Campos once again. Special thanks also go to William for his skilled driving and to Caroline for her logistical support from our Field Guides office in Austin. Of course, thanks also go to every member of our group, and I hope to see you all out in the field again soon. Good birding, and pura vida! LITTLE TINAMOU (Crypturellus soui) – We heard the quavering whistles of these tinamous from forests in the Pacific lowlands, and were fortunate to see two walking along the forest floor on the La Gamba-Golfito Road. BLACK-BELLIED WHISTLING-DUCK (Dendrocygna autumnalis) – A flock of 11 flew by at the Ciudad Neily rice fields, and we saw one more from the bridge over the Rio Tarcoles. GRAY-HEADED CHACHALACA (Ortalis cinereiceps) – These slender cracids were at Talari Mountain Lodge and also in the San Vito area. This was the first of 5 (!) Turquoise Cotingas that we encountered through our journey. Group member Ron Majors did well to take this lovely photo of the bird in the short moments it was with us at Talari Mountain Lodge. CRESTED GUAN (Penelope purpurascens) – These big arboreal cracids were particularly noisy and showy as they fed on palm fruit at Wilson BG. 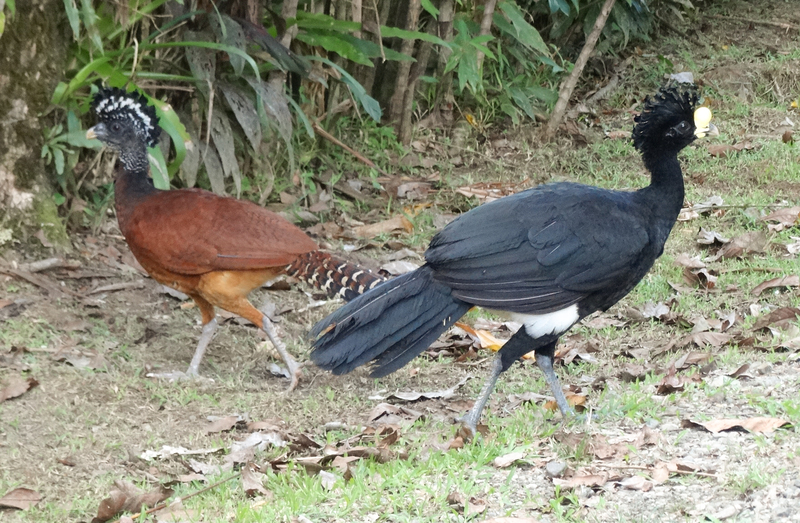 GREAT CURASSOW (Crax rubra) – We found thesemassive birds wandering around the grounds of Esquinas Rainforest Lodge, regularly showing off their expressive crests. MARBLED WOOD-QUAIL (Odontophorus gujanensis) – Vernon spotted a pair of these handsome and secretive critters along a trail at Wilson BG. PALE-VENTED PIGEON (Patagioenas cayennensis) – These were the pigeons we saw regularly in the Pacific lowlands. SCALED PIGEON (Patagioenas speciosa) – We saw a couple of these lovely pigeons perched up as we ate breakfast on the veranda at Talari Mountain Lodge. RED-BILLED PIGEON (Patagioenas flavirostris) – These were common around the Hotel Bougainvillea in the Central Valley. BAND-TAILED PIGEON (Patagioenas fasciata) – These flew by us as we watched the feeders and flowers at Bosque de Tolomuco. SHORT-BILLED PIGEON (Patagioenas nigrirostris) – Fairly common in the lowland forests around Esquinas Rainforest Lodge. We also heard the species below Wilson BG. INCA DOVE (Columbina inca) – A few were on wires on the Pacific Coast as we drove back toward San Jose on our final day. RUDDY GROUND-DOVE (Columbina talpacoti) – Common in open areas in middle and low elevations. BLUE GROUND-DOVE (Claravis pretiosa) – These doves flew past us at great speed in the area around Ciudad Neily and Coto 47. WHITE-TIPPED DOVE (Leptotila verreauxi) – Common in middle and low elevations, especially in edge habitats. Our meal was interrupted in a very positive way when these Fiery-billed Aracaris dropped in to work over the bananas at Talari Mountain Lodge. Photo by group member Jean Rigden. GRAY-CHESTED DOVE (Leptotila cassinii) – One liked to rummage around in the compost pile at Talari Mountain Lodge. WHITE-WINGED DOVE (Zenaida asiatica) – Common around the Hotel Bougainvillea. MOURNING DOVE (Zenaida macroura) – During our bathroom stop in Cartago on the first day, these familiar doves were together with Killdeer on a vacant lot. SMOOTH-BILLED ANI (Crotophaga ani) – These were the anis we saw regularly in open habitats in the southern Pacific lowlands. GROOVE-BILLED ANI (Crotophaga sulcirostris) – We found this cuckoo at the bridge over the Rio Tarcoles. STRIPED CUCKOO (Tapera naevia) – We heard one at Coto 47 and later saw one through the scopes along the Esquinas Rainforest Lodge entrance drive. SQUIRREL CUCKOO (Piaya cayana) – One flew across the road in front of us near Wilson BG. LESSER NIGHTHAWK (Chordeiles acutipennis) – A few of these cryptic aerialists milled around over fields near La Gamba late one evening as we approached Esquinas Rainforest Lodge. 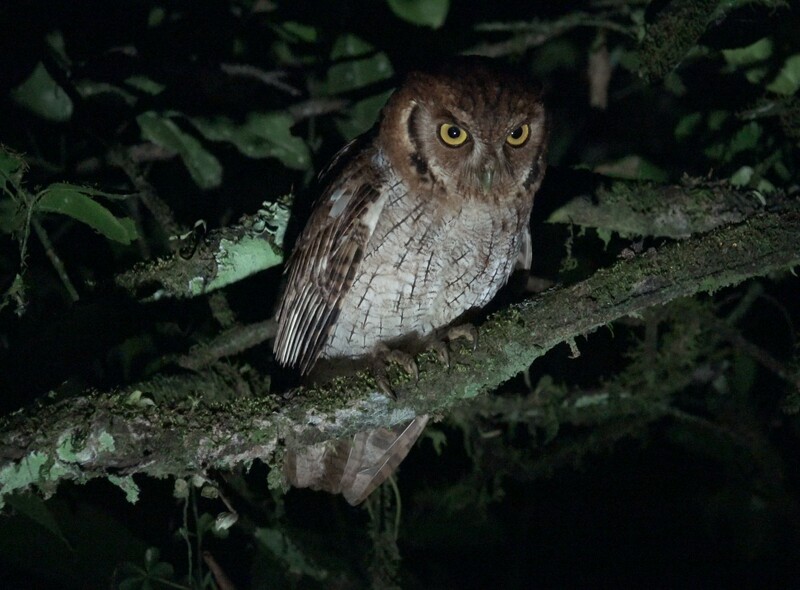 COMMON PAURAQUE (Nyctidromus albicollis) – Common, with regular night-time sightings at Talari Mountain Lodge and near Esquinas Rainforest Lodge. COMMON POTOO (Nyctibius griseus) – We spotlighted one during our night drive from Esquinas. CHESTNUT-COLLARED SWIFT (Streptoprocne rutila) – Good views of these medium-large swifts overhead near the towers on Cerro de la Muerte. 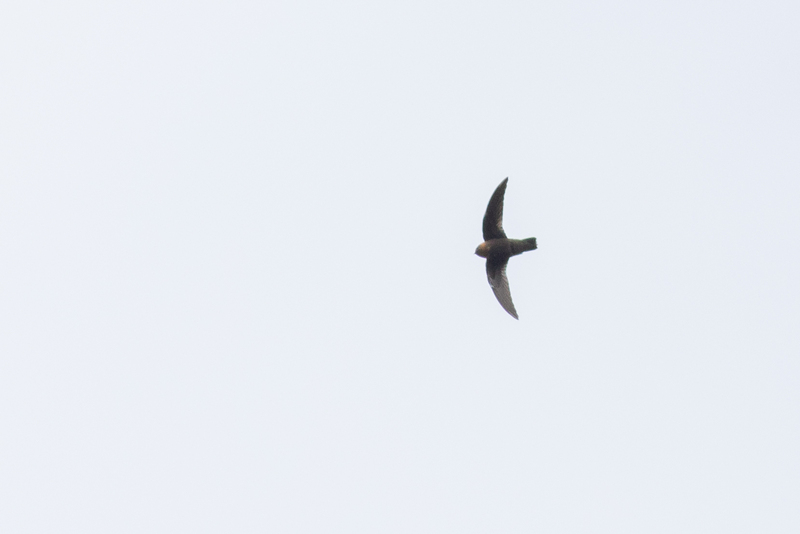 WHITE-COLLARED SWIFT (Streptoprocne zonaris) – A few flocks of these huge swifts swirled overhead at various spots. VAUX'S SWIFT (Chaetura vauxi) – A big flock swirled overhead at Wilson BG, and we also got to hear their chittering calls emanating from the inside of a big hollow tree. COSTA RICAN SWIFT (Chaetura fumosa) – We saw a few overhead as we walked through the forest below Esquinas Rainforest Lodge. WHITE-NECKED JACOBIN (Florisuga mellivora) – One hawked insects from the top of a tall tree at the Rincon Bridge. This pair of majestic Great Curassows posed perfectly for group member Alison Van Keuren. 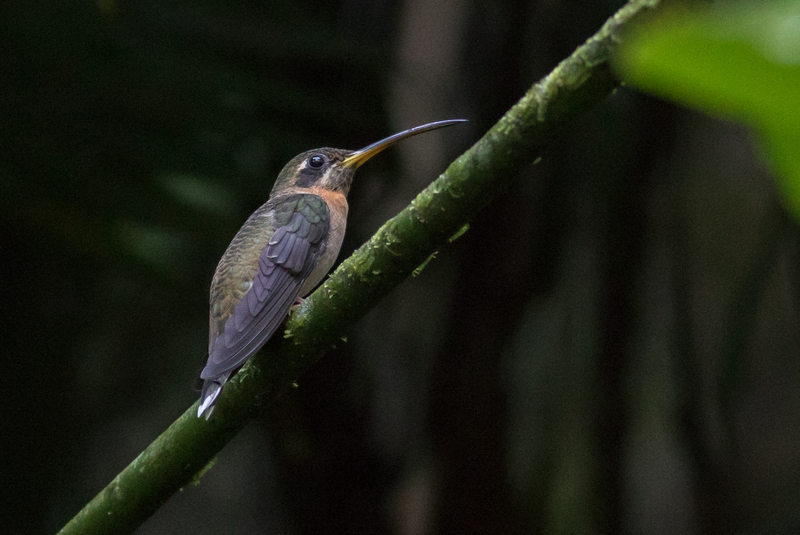 GREEN HERMIT (Phaethornis guy) – Lekking birds approached us closely along the trails at Wilson BG. LONG-BILLED HERMIT (Phaethornis longirostris) – Close views at heliconia flowers at Esquinas Rainforest Lodge. STRIPE-THROATED HERMIT (Phaethornis striigularis) – This tiny hermit fed on flowers in front of us at length below the rooms at Wilson BG. LESSER VIOLETEAR (Colibri cyanotus) – These hummingbirds were rather dominant around the highland feeders at Paraiso Quetzal. PURPLE-CROWNED FAIRY (Heliothryx barroti) – We had a few brief views of these elegant hummers during our stay at Wilson BG. GREEN-BREASTED MANGO (Anthracothorax prevostii) – How strange! A female was nesting on a utility wire over a road near San Isidro del General. We only saw the bird and found the nest because we had stopped the bus to scope a Pearl Kite, which the mango proceeded to attack as we watched. VERAGUAN MANGO (Anthracothorax veraguensis) – One was defending a line of flowering trees during a rainstorm in Coto 47. This species has moved in from Panama in recent years. WHITE-CRESTED COQUETTE (Lophornis adorabilis) – Yowza - this little beauty foraged on verbena flowers below eye level at Bosque del Tolomuco, and we saw a few distant individuals at flowers at Talari Mountain Lodge and on the La Gamba - Golfito Road. GREEN-CROWNED BRILLIANT (Heliodoxa jacula) – Just a few attended the feeders at Bosque del Tolomuco. TALAMANCA HUMMINGBIRD (Eugenes spectabilis) – This long-billed, large hummer used to be considered the southern form of Magnificent Hummingbird. Talamanca Hummingbird is endemic to the mountains of Costa Rica and western Panama. FIERY-THROATED HUMMINGBIRD (Panterpe insignis) – These boisterous hummingbirds were fairly common in the highlands of Cerro de la Muerte. PURPLE-THROATED MOUNTAIN-GEM (Lampornis calolaemus) – A female appeared overhead briefly, showing her pumpkin-colored underparts, while we were watching the quetzals at La Esperanza. RUBY-THROATED HUMMINGBIRD (Archilochus colubris) – These familiar hummers showed several times at Hotel Bougainvillea and Talari Mountain Lodge. 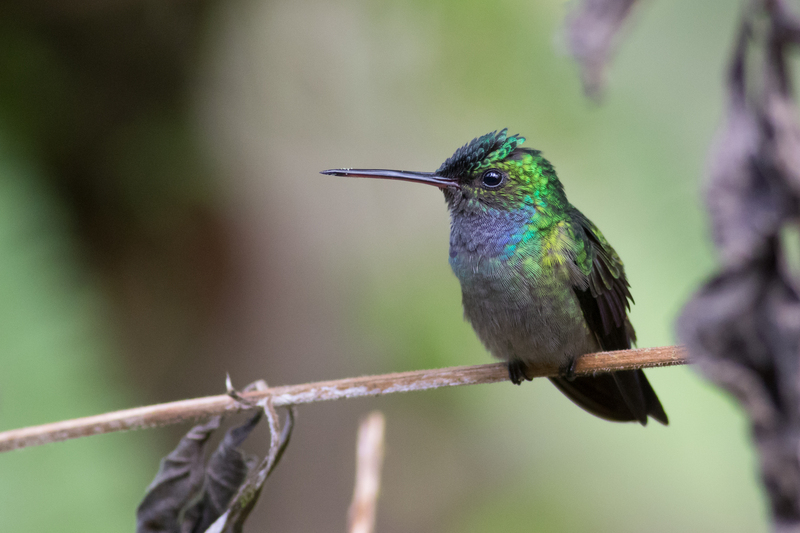 VOLCANO HUMMINGBIRD (Selasphorus flammula) – These tiny hummingbirds were fairly common in the highlands of Cerro de la Muerte. It is possible that this species will be split in the future, with this Talamanca form considered distinct from the forms found on volcanic peaks elsewhere in Costa Rica. GARDEN EMERALD (Chlorostilbon assimilis) – At least one fed on low flowers at the edge of the San Vito airport marsh while we watched from the runway. VIOLET-HEADED HUMMINGBIRD (Klais guimeti) – On our final day at Esquinas Rainforest Lodge, one of these hummers fed on verbena along the driveway as we watched from close range. SCALY-BREASTED HUMMINGBIRD (Phaeochroa cuvierii) – These were the big, noisy hummingbirds that were singing all over the place between Talari Mountain Lodge and Wilson BG. VIOLET SABREWING (Campylopterus hemileucurus) – These brutes were at the feeders at Bosque del Tolomuco; we saw another at Wilson BG. CROWNED WOODNYMPH (Thalurania colombica) – We saw these widespread forest hummingbirds a few times near Esquinas Rainforest Lodge. STRIPE-TAILED HUMMINGBIRD (Eupherusa eximia) – Excellent views at Bosque del Tolomuco. WHITE-TAILED EMERALD (Elvira chionura) – A male and a female were superstars at Bosque del Tolomuco. CHARMING HUMMINGBIRD (Amazilia decora) – Our first was a singing bird that we watched through the scope at Wilson BG; later, we saw quite a few more in the lowlands between Esquinas and the Osa Peninsula. We were met by Charming Hummingbirds on several occasions between Wilson Botanical Garden and the gardens at Esquinas Rainforest Lodge. Photo by guide Tom Johnson. STEELY-VENTED HUMMINGBIRD (Amazilia saucerottei) – Our only sighting was at the Hotel Bougainvillea. SNOWY-BELLIED HUMMINGBIRD (Amazilia edward) – A few in the middle elevations, with the birds at Bosque del Tolomuco offering the best views. RUFOUS-TAILED HUMMINGBIRD (Amazilia tzacatl) – Common and widespread. SAPPHIRE-THROATED HUMMINGBIRD (Lepidopyga coeruleogularis) – Yip yip! We had fantastic luck to see this rare-in-Costa Rica species at a flowering tree near Ciudad Neily. BLUE-THROATED GOLDENTAIL (Hylocharis eliciae) – We had a few brief views of this hummingbird near the Rincon Bridge, but it was a tough one to lock on. PAINT-BILLED CRAKE (Mustelirallus erythrops) – It took a bit of patience and effort, but we eventually all saw this handsome and elusive crake in a rice field near Ciudad Neily. A first for this tour route! GRAY-COWLED WOOD-RAIL (Aramides cajaneus) – Fairly common in lower and middle elevations. PURPLE GALLINULE (Porphyrio martinica) – Fairly common between Esquinas Rainforest Lodge and the Ciudad Neily area. BLACK-NECKED STILT (Himantopus mexicanus) – Three were on the Rio Tarcoles as seen from the "crocodile bridge". BLACK-BELLIED PLOVER (Pluvialis squatarola) – One was at the river mouth at Dominical. SOUTHERN LAPWING (Vanellus chilensis) – Several sightings in the Pacific lowlands. SEMIPALMATED PLOVER (Charadrius semipalmatus) – These small plovers were at the edge of mangroves on the Osa Peninsula and also in Dominical. KILLDEER (Charadrius vociferus) – Two were with Mourning Doves next to the Megasuper grocery store in Cartago. NORTHERN JACANA (Jacana spinosa) – Just a handful were in the wet fields near the entrance to Esquinas Rainforest Lodge. WHIMBREL (Numenius phaeopus) – One was at the river mouth at Dominical. Our time in the hills near San Vito led us to this handsome Costa Rican Brushfinch. Photo by guide Tom Johnson. RUDDY TURNSTONE (Arenaria interpres) – One was at the river mouth in Dominical. LEAST SANDPIPER (Calidris minutilla) – We saw a few flocks of these tiny sandpipers in Dominical and at the Rincon Bridge. WILSON'S SNIPE (Gallinago delicata) – One flushed at the San Vito airport marsh. SPOTTED SANDPIPER (Actitis macularius) – Fairly common in the Pacific lowlands, including at the Rincon Bridge. SOLITARY SANDPIPER (Tringa solitaria) – One was at a stream crossing at Coto 47. GREATER YELLOWLEGS (Tringa melanoleuca) – We saw this lanky wader twice - one was at Coto 47 and another was on the beach at Dominical. WILLET (Tringa semipalmata) – These big, gray sandpipers were at the Osa Peninsula and also in Dominical. LAUGHING GULL (Leucophaeus atricilla) – Low numbers scattered along the Pacific Coast. ROYAL TERN (Thalasseus maximus) – We saw a flock of these big, crested terns at Dominical. SANDWICH TERN (Thalasseus sandvicensis) – These terns were outnumbered by Royal Terns in the loafing flock at Dominical. WOOD STORK (Mycteria americana) – 22 of these big waders were standing around on a river island upstream from the Rincon Bridge. MAGNIFICENT FRIGATEBIRD (Fregata magnificens) – Common along the Pacific Coast. ANHINGA (Anhinga anhinga) – Three were at a pond along the Pacific Coast during our drive back to San Jose on the tour's final day. NEOTROPIC CORMORANT (Phalacrocorax brasilianus) – Common along rivers. BROWN PELICAN (Pelecanus occidentalis) – Scattered sightings along the Pacific Coast. BARE-THROATED TIGER-HERON (Tigrisoma mexicanum) – These beautiful herons were in wetlands at Coto 47 and Ciudad Neily. GREAT BLUE HERON (Ardea herodias) – A few widely scattered sightings in the Pacific lowlands. Eye-ringed Flatbill is one cute flycatcher! Group member Ron Majors took this excellent portrait during one of several sightings of this forest species. GREAT EGRET (Ardea alba) – Fairly common in the Pacific lowlands. SNOWY EGRET (Egretta thula) – Common in the Pacific lowlands. LITTLE BLUE HERON (Egretta caerulea) – Common. TRICOLORED HERON (Egretta tricolor) – 4 individuals at scattered sites in the Pacific lowlands. CATTLE EGRET (Bubulcus ibis) – Common and widespread. GREEN HERON (Butorides virescens) – Just a few were scattered along wetlands and river edges in the Pacific lowlands. WHITE IBIS (Eudocimus albus) – Small numbers in the Pacific lowlands. ROSEATE SPOONBILL (Platalea ajaja) – Three were near the Wood Storks at the Rincon Bridge. KING VULTURE (Sarcoramphus papa) – Three circled with other vultures during our drive between San Isidro del General and San Vito. Later, we had a great view of one circling over the highway on our final day together. BLACK VULTURE (Coragyps atratus) – Common. TURKEY VULTURE (Cathartes aura) – Common. 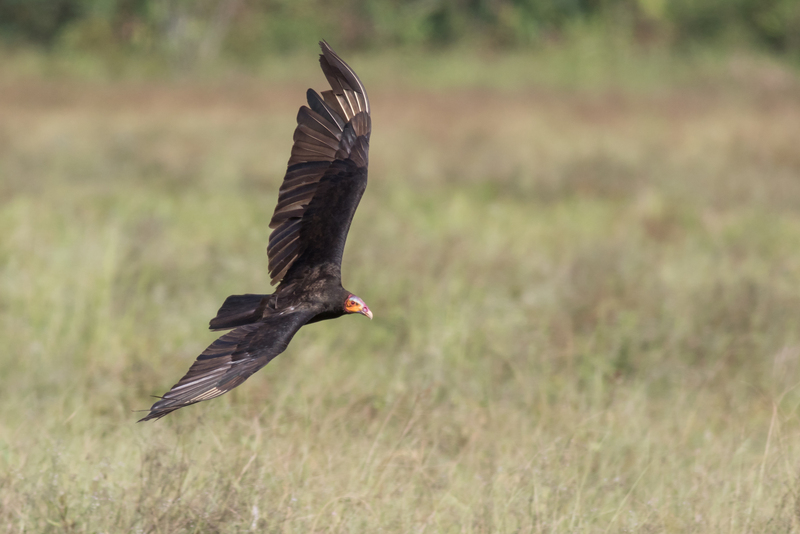 LESSER YELLOW-HEADED VULTURE (Cathartes burrovianus) – Close views in the rice fields near Ciudad Neily. This species is still fairly restricted in the lowlands of Costa Rica. OSPREY (Pandion haliaetus) – At least 5 sightings near water in middle and lower elevations. 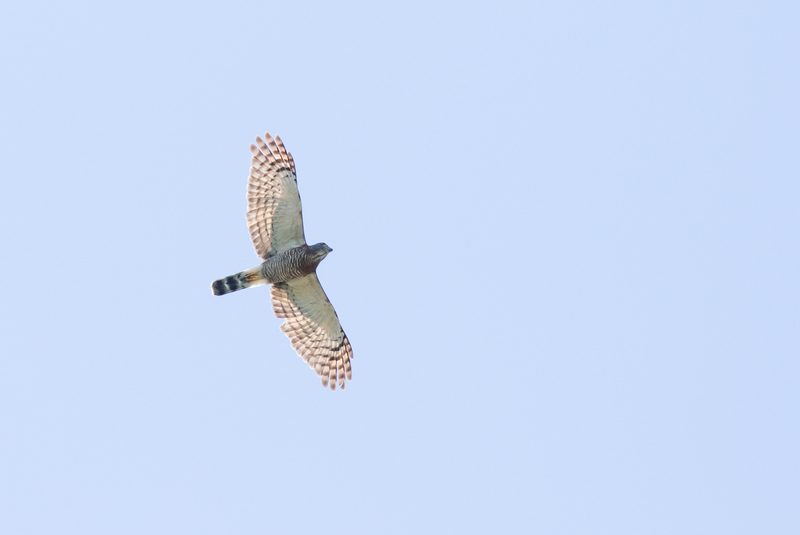 PEARL KITE (Gampsonyx swainsonii) – Great scope views of one bird near San Isidro del General. WHITE-TAILED KITE (Elanus leucurus) – The one that was perched over the road at La Gamba one evening gave us a fantastic view. 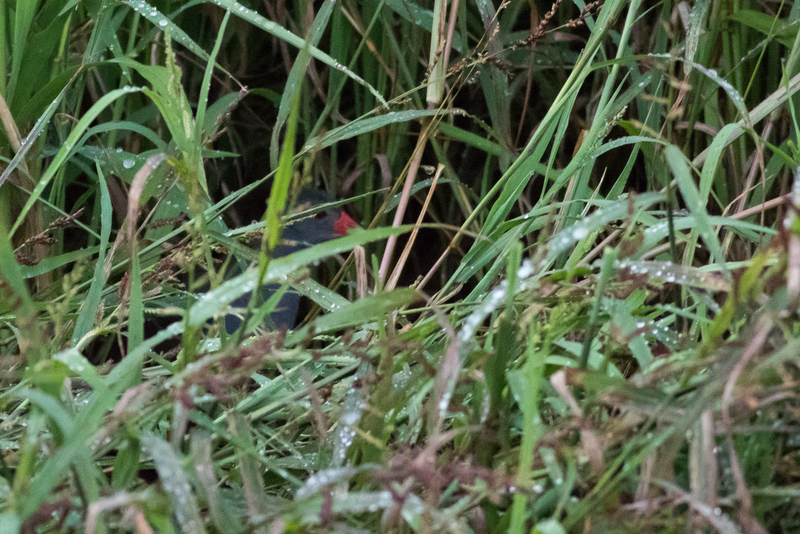 It's not much of a photo, but you can see the gray neck and reddish bill base of a Paint-billed Crake, a hard-won prize that we found near the edge of rice fields at Ciudad Neily. Photo by guide Tom Johnson. GRAY-HEADED KITE (Leptodon cayanensis) – One of these striking raptors flew over while we were birding the valleys near La Union de Sabalito. SWALLOW-TAILED KITE (Elanoides forficatus) – Fairly common in the hills around Wilson BG. DOUBLE-TOOTHED KITE (Harpagus bidentatus) – We saw these distinctive, small raptors soaring on two occasions - once at Los Cusingos and again at Wilson BG. COMMON BLACK HAWK (MANGROVE) (Buteogallus anthracinus subtilis) – One circled over the forest at the Rincon Bridge. SAVANNA HAWK (Buteogallus meridionalis) – We saw this long-legged raptor of open habitats perched atop a distant tree at the Ciudad Neily rice fields. ROADSIDE HAWK (Rupornis magnirostris) – Common and widespread. WHITE HAWK (Pseudastur albicollis) – We enjoyed excellent, close views of a bird perched down low in the forest between La Gamba and Golfito. Another circled over the highway as we headed northwest on our final day. GRAY HAWK (Buteo plagiatus) – We saw one immature nicely at the Rio Tarcoles; a few others were perched along the roadsides as we drove by on the final day of the tour. GRAY-LINED HAWK (Buteo nitidus) – This was the taxon of "Gray Hawk" that we saw in the fields near the entrance to Esquinas Rainforest Lodge. BROAD-WINGED HAWK (Buteo platypterus) – Good views of this wintering species at Talari Mountain Lodge and Wilson BG. SHORT-TAILED HAWK (Buteo brachyurus) – We enjoyed regular sightings of this widespread tropical Buteo - all were light morph birds. RED-TAILED HAWK (COSTARICENSIS) (Buteo jamaicensis costaricensis) – One was at the highest elevation area we visited on the tour, the communication towers atop Cerro de la Muerte. This was the resident subspecies costaricensis. TROPICAL SCREECH-OWL (Megascops choliba) – Spectacular close views on two evenings along the driveway at Talari Mountain Lodge. Double-toothed Kite has an odd shape in flight, something like a mixture of a Buteo and an Accipiter. Here, we can see this unusual shape and the stark contrast between the heavily barred body and the whitish underwing coverts. Photo by guide Tom Johnson. SPECTACLED OWL (Pulsatrix perspicillata) – We heard adults and a youngster at Esquinas Rainforest Lodge, eventually getting great views of the youngster as it yowled from a perch high overhead. MOTTLED OWL (Ciccaba virgata) – We saw one nicely below the veranda at Wilson BG, and heard another one too. STRIPED OWL (Asio clamator) – We found one perched out in a small field near La Gamba during our night drive there. RESPLENDENT QUETZAL (Pharomachrus mocinno) – Woohoo! This most spectacular of Costa Rican birds showed very well at La Esperanza on our first day of birding on the Talamanca Cordillera. We saw a male and a female at fairly close range through the scopes after a short walk. BAIRD'S TROGON (Trogon bairdii) – We enjoyed excellent views of two song-battling males at the Rincon Bridge. GARTERED TROGON (Trogon caligatus) – Fairly common in middle and lower elevations. BLACK-THROATED TROGON (Trogon rufus) – Multiple excellent sightings along the road between La Gamba and Golfito. COLLARED TROGON (Trogon collaris) – Two were on the forest trails at Wilson BG. LESSON'S MOTMOT (Momotus lessonii lessonii) – Common at most forested sites we visited on the tour; we even saw them in the back garden of the Hotel Bougainvillea. RINGED KINGFISHER (Megaceryle torquata) – Fairly common in the Pacific lowlands. AMAZON KINGFISHER (Chloroceryle amazona) – Common in the Pacific lowlands. GREEN KINGFISHER (Chloroceryle americana) – These small kingfishers were sighted repeatedly along rivers - Talari Mountain Lodge and the Rincon Bridge provided our best views. RUFOUS-TAILED JACAMAR (Galbula ruficauda) – Excellent sightings at Wilson BG and Esquinas. FIERY-BILLED ARACARI (Pteroglossus frantzii) – These fantastic-looking toucans showed up to munch on fruit at eye level while we were enjoying our meal in the open-air dining room at Talari Mountain Lodge. YELLOW-THROATED TOUCAN (CHESTNUT-MANDIBLED) (Ramphastos ambiguus swainsonii) – Common and widespread at middle and lower elevations. OLIVACEOUS PICULET (Picumnus olivaceus) – These beautiful, tiny woodpeckers were nesting at the river mirador at Talari Mountain Lodge. 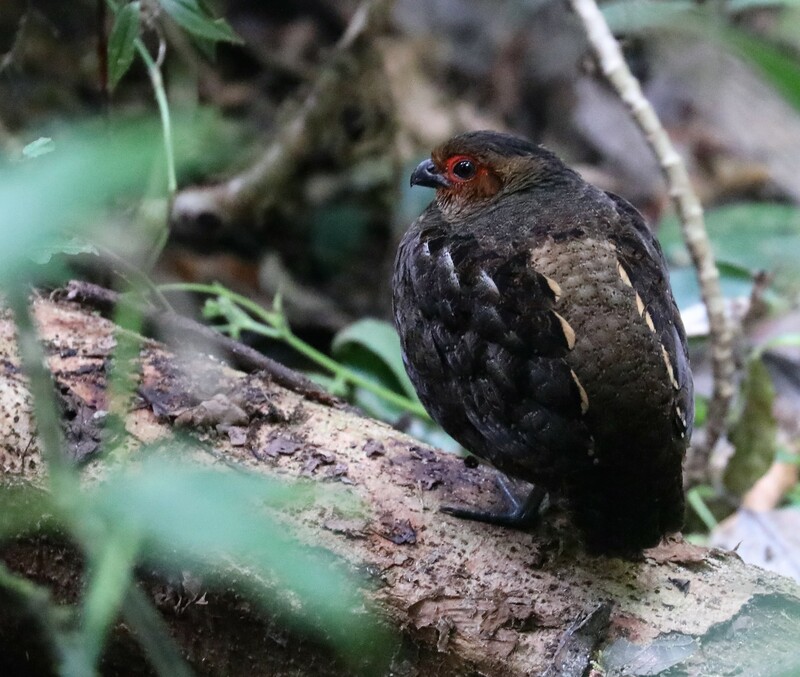 As we walked along the Rio Java trail at Wilson Botanical Garden, Vernon spotted this Marbled Wood-Quail hunkered down to the side of our path. Photo by group member Ron Majors. ACORN WOODPECKER (Melanerpes formicivorus) – A few folks saw one fly over near La Esperanza in the mountains. GOLDEN-NAPED WOODPECKER (Melanerpes chrysauchen) – One of these handsome woodpeckers took a high perch and allowed us to scope it at Los Cusingos. RED-CROWNED WOODPECKER (Melanerpes rubricapillus) – Common throughout most of our travels on the Pacific side. HOFFMANN'S WOODPECKER (Melanerpes hoffmannii) – These mid-sized woodpeckers were easy to see around the Hotel Bougainvillea. SMOKY-BROWN WOODPECKER (Dryobates fumigatus) – Part of the group found one of these small woodpeckers at the edge of the gardens at Wilson BG. RED-RUMPED WOODPECKER (Dryobates kirkii) – Our best look at this small woodpecker was at the Rincon Bridge. LINEATED WOODPECKER (Dryocopus lineatus) – These large woodpeckers showed very nicely at the Rincon Bridge and elsewhere in middle and lower elevations. GOLDEN-OLIVE WOODPECKER (Colaptes rubiginosus) – We managed some nice looks at the Wilson BG. BARRED FOREST-FALCON (Micrastur ruficollis) – We woke up early one day at Wilson BG in order to find this pre-dawn singer. After some repositioning, we managed to watch this lovely raptor up close in the scopes below eye level! CRESTED CARACARA (Caracara cheriway) – Fairly common in open lowlands. YELLOW-HEADED CARACARA (Milvago chimachima) – This was the common small caracara that we saw throughout the journey. LAUGHING FALCON (Herpetotheres cachinnans) – A few sightings of this big-headed snake-eater, including one that perched over the road as we left the Osa Peninsula. BAT FALCON (Falco rufigularis) – We scoped these colorful falcons at Coto 47 (in the rain) and again at the Rio Tarcoles (on top of a transmission tower). 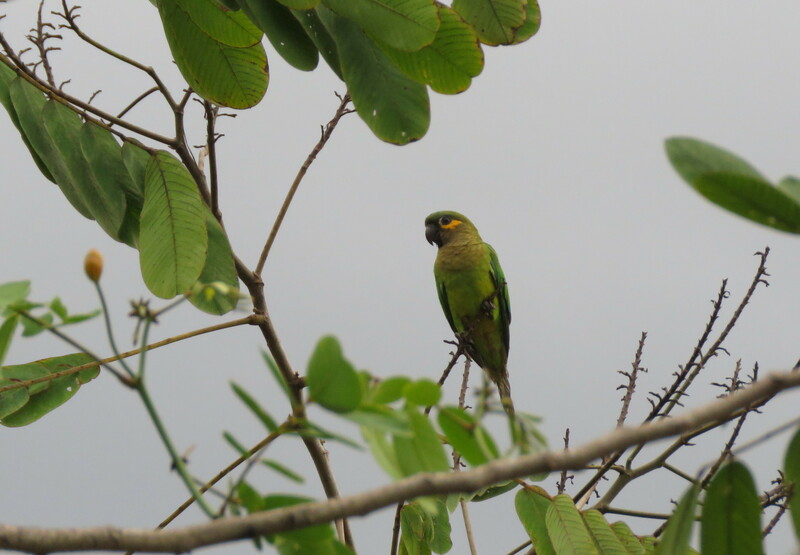 ORANGE-CHINNED PARAKEET (Brotogeris jugularis) – This small parakeet was widespread in middle and low elevations. BROWN-HOODED PARROT (Pyrilia haematotis) – These mid-sized parrots landed right next to us at the top of the hill at Wilson BG one morning. BLUE-HEADED PARROT (Pionus menstruus) – Repeated sightings of this widespread parrot in forested habitats. WHITE-CROWNED PARROT (Pionus senilis) – Our best views were in the Talari-Los Cusingos corridor. RED-LORED PARROT (Amazona autumnalis) – This was the most common Amazona parrot that we found in the Pacific lowlands. 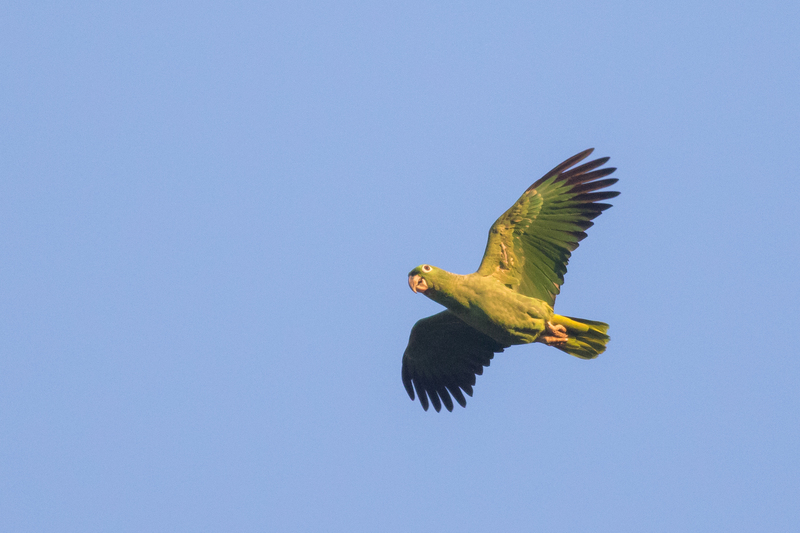 MEALY PARROT (Amazona farinosa) – Common in the morning parrot stream over the Rincon Bridge. BROWN-THROATED PARAKEET (VERAGUAS) (Eupsittula pertinax ocularis) – These striking parakeets were in open habitats near Coto 47, where we had up-close looks. SCARLET MACAW (Ara macao) – We saw 16 flying over at the Rincon Bridge during our morning watch there; a few more pairs were seen during our drive to the northwest along the Pacific Coast on our final day. CRIMSON-FRONTED PARAKEET (Psittacara finschi) – Common, especially in middle elevations. BLACK-HOODED ANTSHRIKE (Thamnophilus bridgesi) – Close-up views along the driveway at Esquinas Rainforest Lodge. RUSSET ANTSHRIKE (Thamnistes anabatinus) – We found these birds dead-leafing while moving with mixed flocks at Los Cusingos and Wilson BG. PLAIN ANTVIREO (Dysithamnus mentalis) – We found a pair working the understory independent of a mixed flock at Wilson BG. 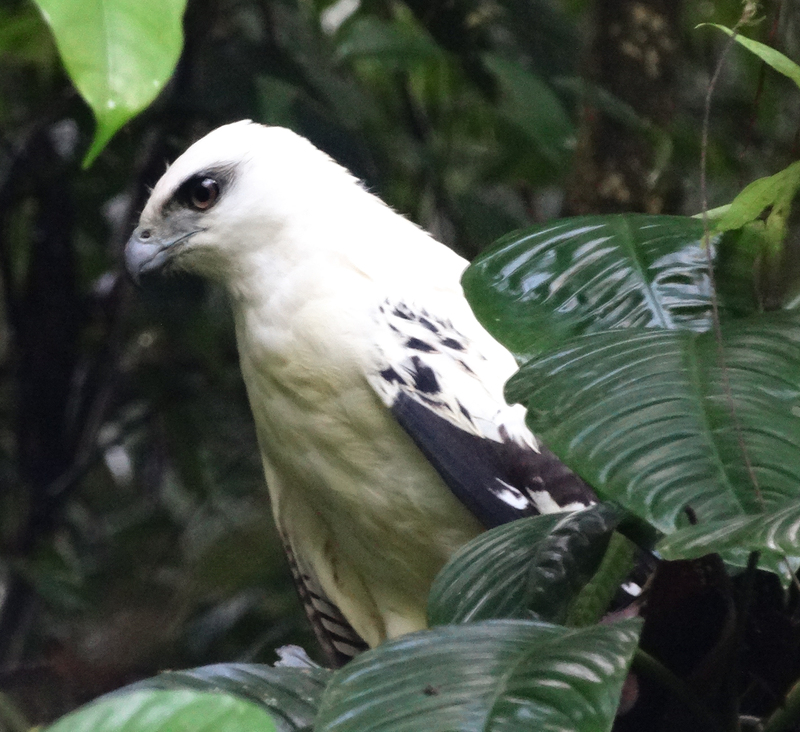 Group member Alison Van Keuren contributed this wonderful photo of a White Hawk that was perched low in the forest between La Gamba and Golfito in the Pacific lowlands. DOT-WINGED ANTWREN (Microrhopias quixensis) – A male-female pair cooperated nicely in the mid-story at Los Cusingos. CHESTNUT-BACKED ANTBIRD (Poliocrania exsul) – It took a bit of maneuvering, but we eventually all enjoyed good looks in the understory at Los Cusingos. BICOLORED ANTBIRD (Gymnopithys bicolor bicolor) – These antbirds were oblivious to us as they attended an army ant swarm in the forest at Los Cusingos. SILVERY-FRONTED TAPACULO (Scytalopus argentifrons) – We heard this shadowbird well, and saw it dart between roots and vines once along the road in to Paraiso Quetzal. BLACK-FACED ANTTHRUSH (Formicarius analis) – We saw these chicken-like songbirds walking around a small army ant swarm at Wilson BG. OLIVACEOUS WOODCREEPER (Sittasomus griseicapillus) – A few sightings of this small woodcreeper at Wilson BG. TAWNY-WINGED WOODCREEPER (Dendrocincla anabatina) – One appeared briefly on the Rio Java trail at Wilson BG. WEDGE-BILLED WOODCREEPER (Glyphorynchus spirurus) – These odd, small woodcreepers foraged in front of us at Wilson BG and Esquinas Rainforest Lodge. COCOA WOODCREEPER (Xiphorhynchus susurrans) – Fairly common at low elevations - good views at Esquinas Rainforest Lodge and at the Rincon Bridge. BLACK-STRIPED WOODCREEPER (Xiphorhynchus lachrymosus) – This beautiful woodcreeper showed nicely along the La Gamba-Golfito Rd. SPOTTED WOODCREEPER (Xiphorhynchus erythropygius) – These mid-sized woodcreepers were with mixed flocks at Wilson BG. STREAK-HEADED WOODCREEPER (Lepidocolaptes souleyetii) – Common in middle and low elevations on the Pacific slope. PLAIN XENOPS (Xenops minutus) – These small, piculet-like ovenbirds were seen repeatedly in mixed flocks at Los Cusingos, Wilson BG, and Esquinas. CHIRIQUI FOLIAGE-GLEANER (Automolus exsertus) – We saw this newly split species (formerly Buff-throated Woodcreeper) at both Wilson BG and Esquinas Rainforest Lodge. STRIPED WOODHAUNTER (Automolus subulatus) – A calling bird responded well to playback between La Gamba and Golfito and showed along the road. RUDDY TREERUNNER (Margarornis rubiginosus) – Three of these highland ovenbirds were in a mixed flock along the Providencia Road on Cerro de la Muerte. PALE-BREASTED SPINETAIL (Synallaxis albescens) – We coaxed a pair of these open country ovenbirds out of the tall grasses in La Union de Sabalito. YELLOW-BELLIED TYRANNULET (Ornithion semiflavum) – One responded very nicely to playback at Los Cusingos, and we heard another one at Esquinas. Band-tailed Barbthroats have been extremely reliable for us in a particular area near Esquinas Rainforest Lodge. In each of the past five years, we've found an active nest of this species - a woven sock hanging precariously from a large heliconia leaf. Photo by guide Tom Johnson. YELLOW TYRANNULET (Capsiempis flaveola) – These energetic flycatchers put on a good show in second growth along the Esquinas Rainforest Lodge driveway. GREENISH ELAENIA (Myiopagis viridicata) – One was with a flock at Wilson BG. YELLOW-BELLIED ELAENIA (Elaenia flavogaster) – Fairly common and widespread. MOUNTAIN ELAENIA (Elaenia frantzii) – This handsome flycatcher was noisy and common in the highlands of Cerro de la Muerte. OCHRE-BELLIED FLYCATCHER (Mionectes oleagineus) – A few were flipping their wings (alternately) along the La Gamba-Golfito Road. SLATY-CAPPED FLYCATCHER (Leptopogon superciliaris) – One was with a large mixed flock along the Rio Java trail at Wilson BG. ROUGH-LEGGED TYRANNULET (Phyllomyias burmeisteri) – This uncommon species was a nice surprise just outside the reception building at Wilson BG as we were getting ready to leave. We managed some nice scope views and heard the bird's distinctive voice. MISTLETOE TYRANNULET (Zimmerius parvus) – Formerly known as Paltry Tyrannulet. Common and widespread. SCALE-CRESTED PYGMY-TYRANT (Lophotriccus pileatus) – This tiny flycatcher was common by voice in the forest at Wilson BG; we managed a few good looks, but certainly heard it more than we saw it. NORTHERN BENTBILL (Oncostoma cinereigulare) – We heard this flycatcher at Esquinas Rainforest Lodge a few times, but it simply wouldn't show itself. SLATE-HEADED TODY-FLYCATCHER (Poecilotriccus sylvia) – After hearing a few calling from the protection of vine tangles, most of us got to see one along the driveway at Esquinas Rainforest Lodge. COMMON TODY-FLYCATCHER (Todirostrum cinereum) – Common and widespread in middle and lower elevations. EYE-RINGED FLATBILL (Rhynchocyclus brevirostris) – Our first one gave us great views at the edge of the garden at Los Cusingos; others were at Wilson BG and Esquinas Rainforest Lodge. YELLOW-OLIVE FLYCATCHER (Tolmomyias sulphurescens) – We saw this unobtrusive flycatcher on multiple occasions near Esquinas Rainforest Lodge - one in particular posed nicely along the streamside along the road to Golfito. GOLDEN-CROWNED SPADEBILL (Platyrinchus coronatus) – This tiny forest flycatcher with the comically wide bill made a great appearance along the trail at Los Cusingos. The subspecies of Brown-throated Parakeet found in southern Costa Rica and adjacent Panama has a beautiful slice of yellow on the face, as we can see in this photo by group member Jean Rigden. SULPHUR-RUMPED FLYCATCHER (Myiobius sulphureipygius aureatus) – One was acting like a redstart (characteristically) in the forest at Los Cusingos. BRAN-COLORED FLYCATCHER (Myiophobus fasciatus) – A pair of these open country flycatchers were in a marshy field near Wilson BG. OLIVE-SIDED FLYCATCHER (Contopus cooperi) – One of these boreal migrants was hawking insects from a dead snag along the entrance road to Esquinas Rainforest Lodge. YELLOW-BELLIED FLYCATCHER (Empidonax flaviventris) – This is a fairly common wintering species in Costa Rica, and we saw it repeatedly in the lower levels of forest edges. BLACK-CAPPED FLYCATCHER (Empidonax atriceps) – A few of these distinctive Empidonax were with mixed flocks in higher elevation forest on Cerro de la Muerte. BLACK PHOEBE (Sayornis nigricans) – A few were perched on rocks along the Rio General near Talari Mountain Lodge. BRIGHT-RUMPED ATTILA (Attila spadiceus) – This species was conspicuous by voice in most large chunks of forest along our route; however, the amazing, eye-level views we enjoyed from the veranda at Wilson BG were truly memorable. RUFOUS MOURNER (Rhytipterna holerythra) – We heard and saw this odd flycatcher on several locations near Esquinas Rainforest Lodge. GREAT CRESTED FLYCATCHER (Myiarchus crinitus) – A wintering, "wheep"-ing individual showed very nicely at the Rincon Bridge. GREAT KISKADEE (Pitangus sulphuratus) – Common and widespread. BOAT-BILLED FLYCATCHER (Megarynchus pitangua) – This kiskadee look-alike was fairly common, with some nice sightings at Talari Mountain Lodge. RUSTY-MARGINED FLYCATCHER (Myiozetetes cayanensis) – A pair of these recent invaders from Panama showed nicely in response to playback along the entrance road to Esquinas Rainforest Lodge. SOCIAL FLYCATCHER (Myiozetetes similis) – Common and widespread. GRAY-CAPPED FLYCATCHER (Myiozetetes granadensis) – Fairly common, especially near water. We saw our first at the Boat-billed Heron colony, and several more were in the area of Esquinas Rainforest Lodge. Photos helped to reveal some of the color on the neck of this Chestnut-collared Swift, one of many that swirled overhead at Cerro de la Muerte. Photos are fun to look at to commemorate a sighting, but I feel like photography is particularly worthwhile when it can help confirm a tough identification or teach you something interesting about your subject. Photo by guide Tom Johnson. STREAKED FLYCATCHER (Myiodynastes maculatus) – These stocky flycatchers were at Talari Mountain Lodge, Esquinas Rainforest Lodge, and the Rincon Bridge. PIRATIC FLYCATCHER (Legatus leucophaius) – These small, streaky flycatchers were vocally conspicuous at Talari Mountain Lodge and the Rincon Bridge area. TROPICAL KINGBIRD (Tyrannus melancholicus) – Common and widespread. FORK-TAILED FLYCATCHER (Tyrannus savana) – We saw a few flyovers at Talari Mountain Lodge; however, the ones at the Ciudad Neily rice fields were much closer and offered great views. 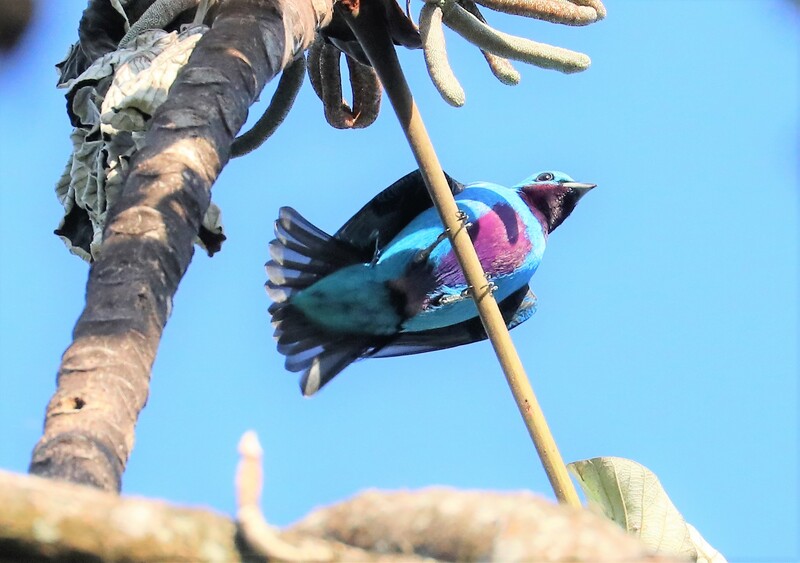 TURQUOISE COTINGA (Cotinga ridgwayi) – Golly! A male popped up briefly overhead at Talari, but it disappeared fairly quickly. Better were the views we had of males and females (4 total) in a treetop at the Rincon Bridge. RUFOUS PIHA (Lipaugus unirufus) – Heard at Los Cusingos; part of the group also saw one sitting inconspicuously in the forest canopy at Wilson BG. YELLOW-BILLED COTINGA (Carpodectes antoniae) – This endangered species is restricted to the Pacific coastline of Costa Rica and adjacent Panama; we visited the Rincon Bridge at dawn with hopes of finding this lovely white cotinga, and we were rewarded with a wonderful view of one displaying male. Another individual flew over us as we were walking on the bridge across the Rio Tarcoles at the end of the tour. WHITE-RUFFED MANAKIN (Corapipo altera) – A few were in the forest at Wilson BG. BLUE-CROWNED MANAKIN (Lepidothrix coronata) – These lovely manakins were in the garden edge at Los Cusingos; a few greenish females were along the driveway at Talari Mountain Lodge. ORANGE-COLLARED MANAKIN (Manacus aurantiacus) – Fairly common in middle and lower elevations; we saw these striking manakins at Talari Mountain Lodge, Los Cusingos, and Esquinas Rainforest Lodge. RED-CAPPED MANAKIN (Ceratopipra mentalis) – One was in the forest at Esquinas Rainforest Lodge. BLACK-CROWNED TITYRA (Tityra inquisitor) – We scoped this species at Los Cusingos and again at the Rincon Bridge. MASKED TITYRA (Tityra semifasciata) – These red-goggled tityras were at Talari Mountain Lodge and the Rincon Bridge. The Tropical Screech-Owl at Talari Mountain Lodge was a real show-off! Photo by group member Ron Majors. BARRED BECARD (Pachyramphus versicolor) – Two played hide and seek with us along the road into Paraiso Quetzal Lodge. WHITE-WINGED BECARD (Pachyramphus polychopterus) – Our sightings of this high contrast becard were at Wilson BG and the Rincon Bridge. ROSE-THROATED BECARD (Pachyramphus aglaiae) – These "rose-less" (this subspecies paradoxically lacks the color found in the name of the species!) becards were often in full view at Wilson BG near the buildings. RUFOUS-BROWED PEPPERSHRIKE (Cyclarhis gujanensis) – One gave us a partial view across the street from the Hotel Bougainvillea. 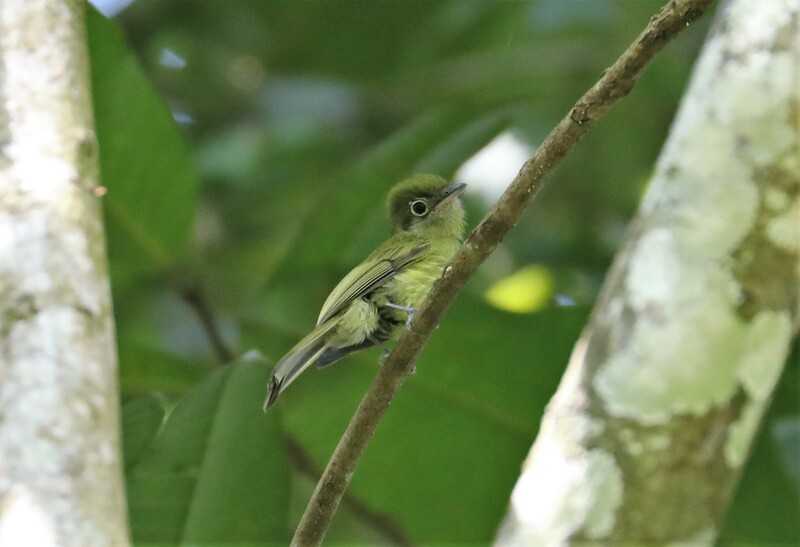 GREEN SHRIKE-VIREO (Vireolanius pulchellus) – We frequently heard the titmouse-like song of this canopy-dweller, and we had a fantastic show from one along the Rio Java trail at Wilson BG. LESSER GREENLET (Pachysylvia decurtata) – Fairly common, but we only had a good view on one occasion - on the side road adjacent to the Rincon Bridge. YELLOW-THROATED VIREO (Vireo flavifrons) – This wintering species was fairly common through middle and lower elevations. YELLOW-WINGED VIREO (Vireo carmioli) – One foraged with a mixed flock in the forests of Cerro de la Muerte. PHILADELPHIA VIREO (Vireo philadelphicus) – This bird is a lot easier to find here in Costa Rica than it is on the breeding grounds in the boreal forests of the northern US and eastern Canada. We enjoyed our best views along the river at Talari Mountain Lodge. BROWN JAY (Psilorhinus morio) – Heard on several occasions, but only a few people had a view of this large songbird. They were surprisingly shy this time around. BLUE-AND-WHITE SWALLOW (Pygochelidon cyanoleuca) – These swallows were common at middle and higher elevations; however, we also saw a few down low in the rice fields near Ciudad Neily. NORTHERN ROUGH-WINGED SWALLOW (Stelgidopteryx serripennis) – One showed off its uniformly brown upperparts along the river at Talari Mountain Lodge. Ah, an Empidonax that you can identify without consulting Sherlock Holmes and a whole lot of dark magic! 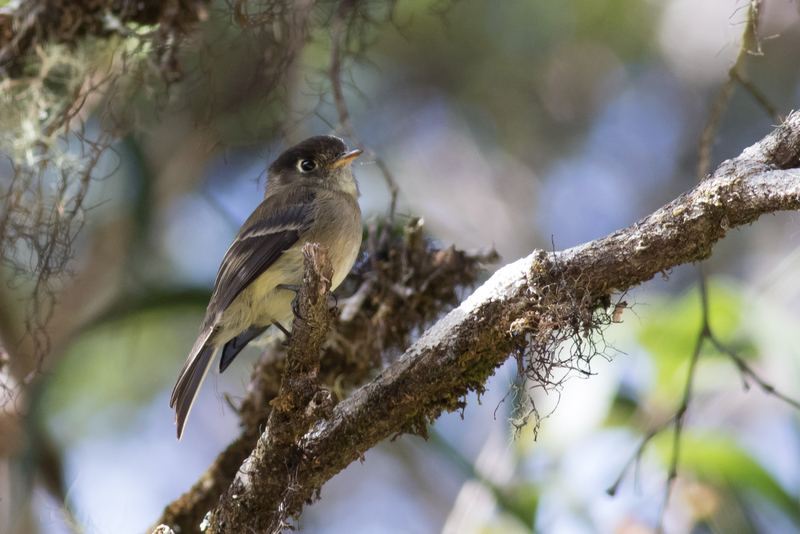 Black-capped Flycatcher was a distinctive species that we found in the montane forests of Cerro de la Muerte. Photo by guide Tom Johnson. SOUTHERN ROUGH-WINGED SWALLOW (Stelgidopteryx ruficollis) – This was the pale-rumped rough-winged swallow that we saw at close range from the Rincon Bridge. GRAY-BREASTED MARTIN (Progne chalybea) – These large swallows were common in the lowlands. MANGROVE SWALLOW (Tachycineta albilinea) – Fairly common in the lowlands near water; we had great looks from the Rincon Bridge. BARN SWALLOW (Hirundo rustica) – About 120 of these long-distance migrants were foraging low over the rice fields near Coto 47. SCALY-BREASTED WREN (WHISTLING) (Microcerculus marginatus luscinia) – One sang from the understory of the forest at Esquinas Rainforest Lodge. HOUSE WREN (Troglodytes aedon) – Relatively common and widespread. TIMBERLINE WREN (Thryorchilus browni) – This highland specialty responded very nicely and showed off its odd white wing edging along the Providencia Road in the highlands of Cerro de la Muerte. RUFOUS-NAPED WREN (Campylorhynchus rufinucha) – A group of five of these big wrens sounded off and cavorted across the street from the Hotel Bougainvillea. BLACK-BELLIED WREN (Pheugopedius fasciatoventris) – After considerable effort, we saw this fine wren in vine tangles near Esquinas Rainforest Lodge. This is the one that often throws out a low song phrase that sounds like "golf ball". RUFOUS-BREASTED WREN (Pheugopedius rutilus) – The sweet song of this widespread wren rang out often at Talari Mountain Lodge and Wilson BG, and we saw the singers on several occasions. RIVERSIDE WREN (Cantorchilus semibadius) – This is another wren species found only in southern Costa Rica and Panama. We saw this heavily barred beauty nicely at Talari Mountain Lodge, Los Cusingos, and the Rincon Bridge area. WHITE-BREASTED WOOD-WREN (Henicorhina leucosticta) – Fairly common in understory at Wilson BG. LONG-BILLED GNATWREN (Ramphocaenus melanurus) – Ours were skulking in tall vines in forest gaps at Wilson BG in between uttering their distinctive mechanical trills. TROPICAL GNATCATCHER (Polioptila plumbea) – This hyperactive songbird was found in pairs working along the edges of forest at Talari Mountain Lodge, Los Cusingos, and the Rincon Bridge. BLACK-BILLED NIGHTINGALE-THRUSH (Catharus gracilirostris) – This montane species hopped out along the roadsides on quite roads on Cerro de la Muerte on our first day of birding. The river vista at the Talari Mountain Lodge was a lovely spot to look for foraging songbirds, patient kingfishers, and even a male Turquoise Cotinga! Photo by guide Tom Johnson. ORANGE-BILLED NIGHTINGALE-THRUSH (Catharus aurantiirostris) – The bird along the river at Talari Mountain Lodge toyed with us a few times, but only a few people caught glimpses. Later, we caught up to another individual in a stand of bamboo at Wilson BG that was much more cooperative, perching out in the open for extended views. SWAINSON'S THRUSH (Catharus ustulatus) – One of these wintering thrushes was at Bosque del Tolomuco, and another was at Talari Mountain Lodge. WOOD THRUSH (Hylocichla mustelina) – One made a very brief appearance in the forest at Esquinas Rainforest Lodge. MOUNTAIN THRUSH (Turdus plebejus) – Fairly common at higher elevations on Cerro de la Muerte. WHITE-THROATED THRUSH (Turdus assimilis) – Part of the group saw one during our stay at Wilson BG. CLAY-COLORED THRUSH (Turdus grayi) – The national bird of Costa Rica - common and widespread. TROPICAL MOCKINGBIRD (Mimus gilvus) – These conspicuous songbirds have become rather common in the area including San Isidro del General and San Vito. BLACK-AND-YELLOW SILKY-FLYCATCHER (Phainoptila melanoxantha) – A few of these odd silky-flycatchers graced the montane forests of Cerro de la Muerte. LONG-TAILED SILKY-FLYCATCHER (Ptiliogonys caudatus) – This slim beauty made a couple of brief appearances overhead on Cerro de la Muerte. YELLOW-CROWNED EUPHONIA (Euphonia luteicapilla) – We saw this species repeatedly along the river at Talari Mountain Lodge. THICK-BILLED EUPHONIA (Euphonia laniirostris) – We got to know these handsome euphonias quite well at the fruit table on the Wilson BG veranda. YELLOW-THROATED EUPHONIA (Euphonia hirundinacea) – One near the Hotel Bougainvillea was a bit of a surprise on our first afternoon together in the wind of the Central Valley. ELEGANT EUPHONIA (Euphonia elegantissima) – Two showed up in mistletoe clumps at Bosque del Tolomuco, a typical middle elevation for the species. The 3 that appeared for Vernon and part of the group at Esquinas Rainforest Lodge were unusual for their low elevation; however, it's the second time we've found them in this context in recent years. SPOT-CROWNED EUPHONIA (Euphonia imitans) – We were fortunate to compare these with Thick-billed Euphonias on the veranda at Wilson BG. SOOTY-CAPPED CHLOROSPINGUS (Chlorospingus pileatus) – This was the high elevation chlorospingus that we found at Paraiso Quetzal and above on Cerro de la Muerte. COMMON CHLOROSPINGUS (Chlorospingus flavopectus) – We saw four of these expressive songbirds in a mixed flock at Wilson BG. Lesser Yellow-headed Vultures tend to fly low to the ground. When you see them against a non-sky background, it's easier to spot the multicolored head and the pale shafts to the outer primaries. Photo by guide Tom Johnson. BLACK-STRIPED SPARROW (Arremonops conirostris) – We enjoyed these olive, black, and gray sparrows in edge habitat and forest near Ciudad Neily, at Esquinas, and at the Rincon Bridge. COSTA RICAN BRUSHFINCH (Arremon costaricensis) – Wow - after a few years of struggling to find this species reliably on the tour, we were really pleased to get such great looks on a densely vegetated slope near San Vito. This lovely brushfinch is found only in Costa Rica and western Panama. ORANGE-BILLED SPARROW (Arremon aurantiirostris) – Our first looks at these wonderful sparrows came as we sat in the open-air dining room at Talari Mountain Lodge. Later, we had another close look along the entrance drive at Esquinas Rainforest Lodge. VOLCANO JUNCO (Junco vulcani) – Two of these highland specialties posed at the communication towers atop Cerro de la Muerte. RUFOUS-COLLARED SPARROW (Zonotrichia capensis) – Almost ubiquitous at middle and high elevations. YELLOW-THIGHED FINCH (Pselliophorus tibialis) – These large, plucky finches were with a mixed flock along the Providencia Road on Cerro de la Muerte. EASTERN MEADOWLARK (Sturnella magna) – We saw a few near Cartago and in the rice fields near Ciudad Neily. RED-BREASTED MEADOWLARK (Leistes militaris) – This expanding species was fairly common in grasslands and agriculture near Ciudad Neily. CRESTED OROPENDOLA (Psarocolius decumanus) – We saw and heard these spectacular oropendolas repeatedly in forest near San Vito and at Wilson BG. SCARLET-RUMPED CACIQUE (SCARLET-RUMPED) (Cacicus uropygialis microrhynchus) – These caciques are often secretive, so it was a special treat seeing them both at Esquinas Rainforest Lodge and again in mangroves on the Osa Peninsula. ORCHARD ORIOLE (Icterus spurius) – Two were with Baltimore Orioles at the edge of Coto 47 in the Pacific lowlands. BALTIMORE ORIOLE (Icterus galbula) – This familiar northern breeder is a particularly common wintering bird in Costa Rica, and we saw them just about everywhere we went. RED-WINGED BLACKBIRD (Agelaius phoeniceus) – One was at the bridge over the Rio Tarcoles. SHINY COWBIRD (Molothrus bonariensis) – These were with a large mixed blackbird flock feeding on spilled rice near Ciudad Neily. The males were particularly distinctive due to their slim shape and glossy purple plumage. We watched a very impressive thunderstorm roll past during one visit to the rice fields near Ciudad Neily. This was the habitat that hosted Sapphire-throated Hummingbird, Savanna Hawk, Paint-billed Crake, Dickcissels, and much more. Photo by guide Tom Johnson. BRONZED COWBIRD (Molothrus aeneus) – This was the most common cowbird that we found near Ciudad Neily; males and females are both recognizable by their red eyes. GIANT COWBIRD (Molothrus oryzivorus) – We saw up to 8 of these red-eyed behemoths in the mixed blackbird flock at the edge of Ciudad Neily. MELODIOUS BLACKBIRD (Dives dives) – This noisy species has become a familiar sight and sound across much of the country; our best experiences with it came around the Hotel Bougainvillea. GREAT-TAILED GRACKLE (Quiscalus mexicanus) – Common and widespread at middle and lower elevations. WORM-EATING WARBLER (Helmitheros vermivorum) – One was seen briefly by a few of us in forest near the Rincon Bridge. NORTHERN WATERTHRUSH (Parkesia noveboracensis) – Fairly common in lower elevations near water. GOLDEN-WINGED WARBLER (Vermivora chrysoptera) – Just a few sightings this time - at Talari Mountain Lode and Wilson BG, in mixed flocks each time. BLACK-AND-WHITE WARBLER (Mniotilta varia) – This distinctive warbler was seen frequently at Talari Mountain Lodge and Wilson BG as it creeped along branches and trunks. FLAME-THROATED WARBLER (Oreothlypis gutturalis) – One appeared in a mixed flock in the canopy along the road in to Paraiso Quetzal. TENNESSEE WARBLER (Oreothlypis peregrina) – Common and widespread; we even saw them attending fruit feeders at Talari and Wilson BG. MOURNING WARBLER (Geothlypis philadelphia) – We heard several and had brief views of one at the San Vito airport marsh. OLIVE-CROWNED YELLOWTHROAT (CHIRIQUI) (Geothlypis semiflava chiriquensis) – This rare taxon used to be considered a subspecies of Masked Yellowthroat, but it has been moved to Olive-crowned following publication of results showing its affinities to that species. We saw a pair in a marshy field near Wilson BG along the border with Panama. AMERICAN REDSTART (Setophaga ruticilla) – We saw one on several occasions in mixed flocks at Talari Mountain Lodge. TROPICAL PARULA (Setophaga pitiayumi) – One was singing and responded nicely along the driveway at Talari Mountain Lodge. BLACKBURNIAN WARBLER (Setophaga fusca) – We saw these handsome warblers a few times near the buildings at Wilson BG. YELLOW WARBLER (Setophaga petechia) – Common and widespread in middle and lower elevations. CHESTNUT-SIDED WARBLER (Setophaga pensylvanica) – This species is a common wintering species in Costa Rica. Mealy Parrots joined a morning commuter route over our heads during our morning watch from the Rincon Bridge on the Osa Peninsula. Photo by guide Tom Johnson. BLACK-THROATED GREEN WARBLER (Setophaga virens) – One was at Paraiso Quetzal, and the other was at Bosque del Tolomuco. Both were first detected by their thin, sharp chip calls. RUFOUS-CAPPED WARBLER (Basileuterus rufifrons) – One near San Vito did its best to pry our eyes away from a nearby Costa Rican Brushfinch. BUFF-RUMPED WARBLER (Myiothlypis fulvicauda) – These tail-waggers were at Talari Mountain Lodge and along the forest trails at Wilson BG. WILSON'S WARBLER (Cardellina pusilla) – This species was reasonably common at higher elevations on Cerro de la Muerte. SLATE-THROATED REDSTART (Myioborus miniatus) – We found this yellow-bellied warbler in mixed flocks at middle elevations at Bosque del Tolomuco and Wilson BG. COLLARED REDSTART (Myioborus torquatus) – This warbler with the striking yellow face put on a quick show overhead on the road in to Paraiso Quetzal Lodge. SUMMER TANAGER (Piranga rubra) – We encountered this widespread Piranga at many middle and lower elevation sites. FLAME-COLORED TANAGER (Piranga bidentata) – A male distracted us momentarily from the Resplendent Quetzals at La Esperanza. RED-CROWNED ANT-TANAGER (Habia rubica) – Two showed up near the compost pile at Talari Mountain Lodge while we were sitting in the dining room. ROSE-BREASTED GROSBEAK (Pheucticus ludovicianus) – These well-marked songbirds were often mixed in with Baltimore Orioles - great views at Bosque del Tolomuco and Talari Mountain Lodge. BLUE-BLACK GROSBEAK (Cyanoloxia cyanoides) – We scoped a singing male near the cabins at Esquinas Rainforest Lodge, and heard another singing near the Rincon Bridge. INDIGO BUNTING (Passerina cyanea) – Two of us had a view of a brown-plumaged bird below the veranda at Talari Mountain Lodge. DICKCISSEL (Spiza americana) – Five were in the weedy edge of a section of rice fields near Ciudad Neily, and we enjoyed nice views of their black-and-yellow marked underparts. 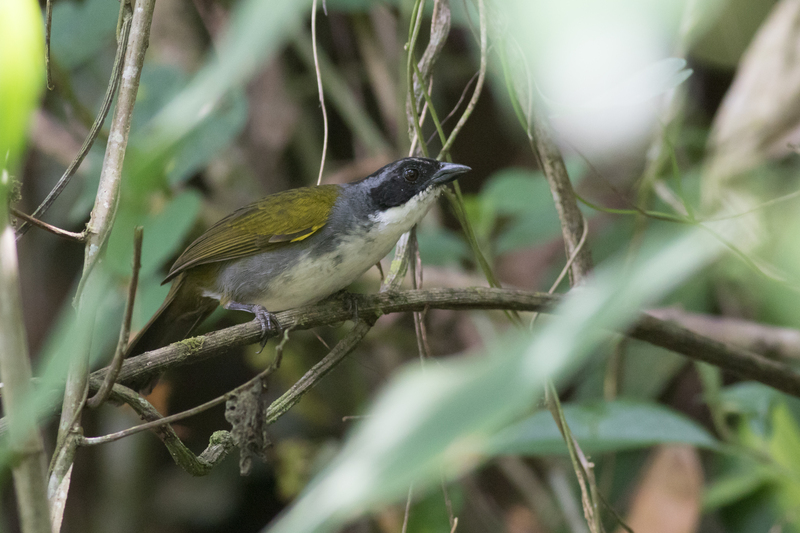 GRAY-HEADED TANAGER (Eucometis penicillata) – Best views were of the small group feeding in the understory at an army ant swarm at Los Cusingos. WHITE-SHOULDERED TANAGER (Tachyphonus luctuosus) – A few sightings of this boldly marked tanager - best was the small group near the river at Los Cusingos. SCARLET-RUMPED TANAGER (CHERRIE'S) (Ramphocelus passerinii costaricensis) – Abundant; formerly split as Cherrie's Tanager. 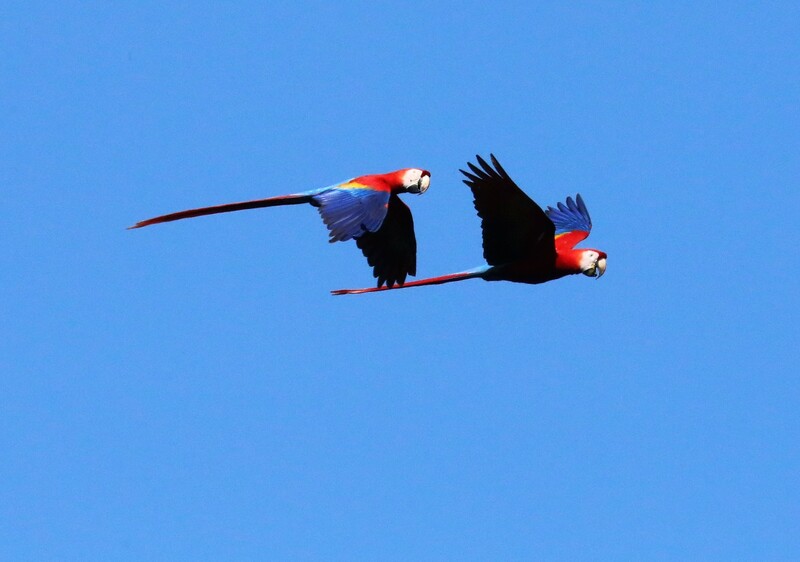 Fabulous Scarlet Macaws graced us with flybys and some perched views during our time at the Rincon Bridge and again near Jaco. Photo by group member Ron Majors. BLUE-GRAY TANAGER (Thraupis episcopus) – Common and widespread. PALM TANAGER (Thraupis palmarum) – Common and widespread. SPECKLED TANAGER (Ixothraupis guttata) – These beauties loved the banana offerings at Talari Mountain Lodge and Wilson BG. GOLDEN-HOODED TANAGER (Tangara larvata) – These were the delightfully common tanagers that we saw repeatedly as they streamed through treetops, always on the way to somewhere else. BAY-HEADED TANAGER (Tangara gyrola) – A few of these striking tanagers were mixed with canopy flocks. The Central American birds have blue underparts that contrast with the apple green upperparts and reddish heads - quite a punch of color! SILVER-THROATED TANAGER (Tangara icterocephala) – These yellowish tanagers were attracted by the fruit feeders at Bosque del Tolomuco and Wilson BG. SCARLET-THIGHED DACNIS (Dacnis venusta) – One made a quick appearance in the misty treetops at Bosque del Tolomuco. BLUE DACNIS (Dacnis cayana) – Four of these colorful tanagers made treetop appearances and waited for us to scope them from the driveway at Esquinas Rainforest Lodge. SHINING HONEYCREEPER (Cyanerpes lucidus) – These were the chunky honeycreepers with the fairly long, decurved bills that we saw a few times at Los Cusingos, Esquinas Rainforest Lodge, and along the road to Golfito. RED-LEGGED HONEYCREEPER (Cyanerpes cyaneus) – Shockingly colorful and amazingly fond of the flowering trees and fruit feeders at Talari Mountain Lodge. GREEN HONEYCREEPER (Chlorophanes spiza) – We saw these beautiful small tanagers up-close on several occasions at fruit feeders, as well as mixed into canopy flocks in the forest. SLATY FLOWERPIERCER (Diglossa plumbea) – This small songbird with the hook-tipped bill was common on Cerro de la Muerte, especially at the highest elevations near the communication towers. BLUE-BLACK GRASSQUIT (Volatinia jacarina) – These tiny, grass-loving songbirds were common in open habitats near Ciudad Neily and Coto 47. RUDDY-BREASTED SEEDEATER (Sporophila minuta) – We scoped a male from the entrance road to Esquinas Rainforest Lodge. This is an uncommon species that we don't find every year. THICK-BILLED SEED-FINCH (Sporophila funerea) – We enjoyed several nice sightings of both males and females - at San Vito, near Wilson BG, and at Esquinas Rainforest Lodge. VARIABLE SEEDEATER (Sporophila corvina) – Common and widespread; these were the pied race of the Pacific slope (differing from the mostly black males found on the Caribbean side of Costa Rica). MORELET'S SEEDEATER (Sporophila morelleti) – The split of White-collared Seedeater created this new species - we saw singing males near Ciudad Neily. YELLOW-BELLIED SEEDEATER (Sporophila nigricollis) – Just a few - at the San Vito airport marsh and again in the fields near Coto 47. BANANAQUIT (Coereba flaveola) – Common and widespread. YELLOW-FACED GRASSQUIT (Tiaris olivaceus) – Our best views of these small, attractive songbirds were in the gardens at Wilson BG. BUFF-THROATED SALTATOR (Saltator maximus) – This species was common and widespread through middle and lower elevations. GRAYISH SALTATOR (Saltator coerulescens) – One was in the scrubby coffee plantation across the street from the Hotel Bougainvillea. STREAKED SALTATOR (Saltator striatipectus) – A few were at Talari Mountain Lodge and Wilson BG; at Wilson, they came in to feed on bananas on the veranda. COMMON OPOSSUM (Didelphis marsupialis) – One came in to feed on fruit in the evening at Talari Mountain Lodge. GRAY FOUR-EYED OPOSSUM (Philander opossum) – This beautiful opossum joined the Common Opossum at Talari Mountain Lodge. GREATER WHITE-LINED BAT (Saccopteryx bilineata) – Day-roosting at Esquinas Rainforest Lodge. MANTLED HOWLER MONKEY (Alouatta palliata) – These big, loud monkeys were spotted a few times through our journey. WHITE-THROATED CAPUCHIN (Cebus capucinus) – A few were at Los Cusingos and again at Esquinas Rainforest Lodge. HOFFMANN'S TWO-TOED SLOTH (Choloepus hoffmanni) – One was positioned at the top of a tall tree on the hill above the Rincon Bridge during our morning outing there. VARIEGATED SQUIRREL (Sciurus variegatoides) – This was the larger and more contrastingly patterned of the two squirrel species we saw on the trip. RED-TAILED SQUIRREL (Sciurus granatensis) – The smaller, more compact squirrel with the reddish-brown tail. CENTRAL AMERICAN AGOUTI (Dasyprocta punctata) – Fairly common on the grounds of Esquinas Rainforest Lodge. WHITE-NOSED COATI (Nasua narica) – A few crossed the road in front of our vehicle in the lowlands. KINKAJOU (Potos flavus) – One was foraging on palm fruit at night, as spotlighted from the veranda at Talari Mountain Lodge. GREEN IGUANA (Iguana iguana) – Common in the lowlands. COMMON BASILISK (Basiliscus basiliscus) – A few were at the edges of rivers in the lowlands. TROPICAL HOUSE GECKO (Hemidactylus mabouia) – Common and welcome at our lodges, where they provide insect control. GREEN SPINY LIZARD (Sceloporus malachiticus) – Also called "Emerald Swift"; Alison photographed and identified one of these fine lizards at the Hotel Bougainvillea. AMERICAN CROCODILE (Crocodylus acutus) – A few dozen of these massive animals were hauled out on the sandbars in the Rio Tarcoles as we ogled them from the bridge above. SPECTACLED CAIMAN (Caiman crocodilus) – Several were in the Pacific lowlands; smaller than American Crocodile. CANE TOAD (Rhinella marina) – We found a few hopping around at night near our lodges.